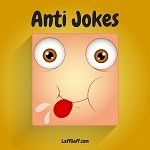 Anti Jokes That Shouldn't Be Funny! Anti jokes are jokes where the listener is set up to expect a funny punchline, but then the joke doesn't deliver it. So they shouldn't be funny, right? Wrong!!! They are just as amusing as normal funny jokes, of course, otherwise we wouldn't be bringing them to you! It's actually the irony of the anticipated punchline not being delivered that makes anti jokes humorous. Enjoy this collection of our favorite examples of the best anti jokes. I can still remember my Grandpa's last words before he kicked the bucket. It doesn't matter what you call him, he's not coming. What has four fingers and a thumb and looks human? What do you call a man with a shovel in his head? An ambulance, due to the fact that he has a rather serious head wound. What did one Japanese man say to the other? I've no idea, I don't speak Japanese. Why are people like drums? Hit them with a stick and they make a noise. That's your age in five years. A deer. The absence of eyes doesn't change the species. What did the muffin say to the tin can? Why are hamsters like cigarettes? They're completely harmless until you put one in your mouth and light it on fire. What starts with "e", ends with "e" and only has one letter in it? Numbers that aren't divisible by two. He didn't. There was a lot of traffic so he thought better of it. A visibly tired and stressed guy walks into a bar and orders a beer. The bartender asks, "Long day?" "No, all days are 24 hours long," the guy replies, amazed at the bartender's lack of education. What do you call one hundred rabbits walking backwards? Anything you like, they can't understand you. What do you get when you cross a crocodile and a llama? Because he only uses the finest ingredients. Hit him with an axe. What leaves a bigger hole in your heart than breaking up with your girlfriend? An eagle and a squirrel are sitting in a tree watching a farmer plough his field. The squirrel turns to the eagle but doesn't say anything because squirrels can't talk. The eagle then eats the squirrel because he's a bird of prey. Why didn't Mary go to the party? There are many ways but all of them are wrong because murder is illegal. Then he gets a drink and leaves. Steve proceeds to break down into tears because his Grandmother's Alzheimer's has advanced to the stage where she no longer remembers him. What would Santa Claus be called if he had no hands? Probably still Santa Claus, however he doesn't exist so it doesn't really matter. Chuck Norris walks into a bar. He's treated with great respect because he's such a talented actor. Have you ever noticed that when geese fly in a 'V' formation, one line is always longer than the other? Do you know why that is? Because there are more geese in that line. Why is a laser beam like a goldfish? Because neither one can whistle. Why are friends a lot like snow? If you pee on them they disappear. And a pretty good spring and summer too. What's black and white and eats like a horse? What do a banana and a helicopter have in common? Neither of them is a police officer. What's the difference between a rabbit and a grape? They're both purple, except the rabbit isn't. Several people get up and leave as they recognize the potential danger in the situation. I was diagnosed with clinical depression the other day. My friend always complains that my jokes have irrelevant punchlines. It wasn't. Numbers aren't sentient and are incapable of feeling fear. Because of her repeated absences and stealing. What's green, red, orange, purple, blue and yellow? Look do you want this parcel or not? You can pick your nose and you can pick your friends. But you can't rob a bank. That's a felony. One's a musical instrument, the other's an animal. What's orange and tastes like an orange? What do friends and trees have in common? They both fall over if you hit them repeatedly with an axe.